If you have ever dreamed of owning a flying car, then you may well be able to buy and fly one in the UK next year. 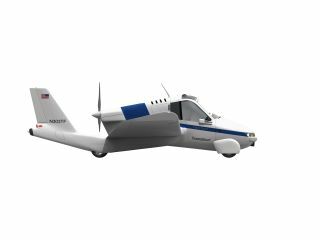 The Transition Roadable Aircraft, designed and manufactured by US company Terrafugia, is a road-worthy vehicle that has fold-out wings and is able to automatically convert into a fully-capable airplane in around 20 seconds. It's the stuff of our childhood sci-fi dreams, for sure. Although, to be fair, Terrafugia's Transition Roadable Aircraft doesn't look as cool as our 10-year-old selves' imagineered in our heads. Plus, it is going to cost Brits somewhere between £125,000 and £160,000, plus shipping costs, when we can finally purchase one at some point in the next year or two. Terrafugia CEO Carl Dietrich says: "A lot of people said they never thought it would fly. But we have a vehicle right here, right now that drives and flies, and converts between the two in 20 seconds." Terrafugia's flying car runs on bog-standard unleaded and the cockpit features touch-screen controls and a small cargo area to throw in the family's suitcases as you head off into the sunset. Terrafugia's VP of business development Richard Gersh informed TechRadar this week that: "Although we are accepting international orders via a refundable deposit forthe Transition, our primary focus is the US certification standards. As we get closer to production in late 2011, we will be reviewing foreign standards, including those in the UK." Plus, before you put your deposit down, it might be worth checking that you have all the relevant pilot's licenses and certification from the Civil Aviation Authority (CAA) and the European Aviation Safety Agency (EASA). "The flying car should be considered an aircraft first and a car second, the aircraft would have to be registered either on the UK register or on another ICAO contracting state's register and have a Certificate of Airworthiness issued by the state of registry," a CAA rep informed TechRadar when we asked them about the law on flying cars earlier. "The pilot would also have to a pilot's license and an annual medical as normal. I would imagine that the pilot would also have to have the appropriate driving license for this as well." As Terrafugia's flying car is 650kg it would also be the responsibility of EASA to certify the aircraft. The current EASA code that covers an aircraft of this weight is CS VLA (up to 890 kg). The aircraft would need to be registered and have an EASA approval before it could fly legally.